No need to say anything about the albino full red guppy strain. All of its body are red colored, including the eyes because they are albinos. 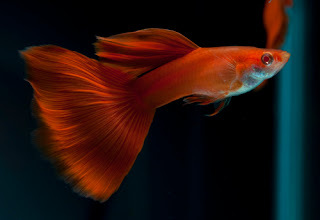 As you can see in the picture, no pattern of its body so it’s called full red. Even though the bottom side of this strain is still white yellowish colored. But that’s not decrease the beautiful value of this fish.